This meal makes a decadent weeknight dinner. Since duck is so rich, two people can very comfortably split one large breast. This not only saves calories, it saves cash. In a small sauce pot over medium low heat, combine the vinegar, molasses and ginger. When the sauce comes up to a boil and becomes syrupy, turn off the heat. In a medium sauce pot over medium-high heat, combine the grits, milk and water. Whisk. Continue to whisk every few minutes until grits come up to a boil. Reduce heat to a simmer. Cook, stirring every minute or two, until grits are soft and liquid is absorbed. If mixture gets too dry, add water. When grits are done, remove from heat. Add cheese & salt & pepper to taste. While the grits are cooking, cook the duck. In a medium saucepan over medium-high heat, add 1 Tbsp. olive oil and bring up to temp. Add the duck skin-side down – season with salt & pepper and sautée until deeply browned. Flip, season, and sautée on side 2 until deeply brown. Knock the heat back and continue to cook until medium-rare. Duck feels just like beef to the touch. Remove from the pan and set aside to rest while you cook the broccolini. Drain fat. Put the pan back over the heat with 1 Tbsp. olive oil. Add broccolini. Sautée 7 minutes or until tender. Season with salt and pepper. 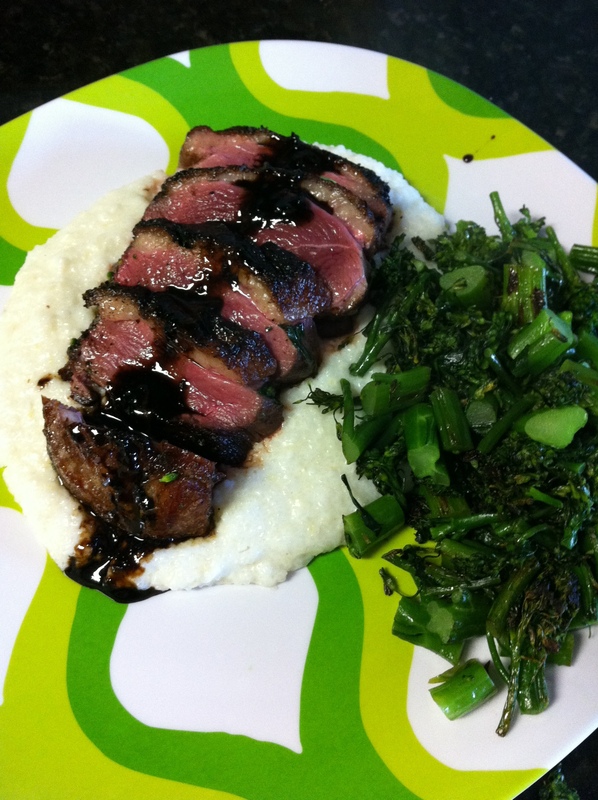 Slice the duck and serve with grits, broccolini and pomegranate molasses sauce.